Tapatio Salsa Picante Hot Sauce 32 oz. Tapatio hot sauce or salsa picante made with chiles and spices. Tapatio pronounced [Tah-pah-tee-o] is a Mexican hot sauce that is well known for its wild and mild flavor. This flavorful condiment has mild heat and is perfect for improving the taste and adding a touch of flavor to almost any dish without stinging or numbing your tongue. It is most commonly used on snacks such as fruits, vegetables, chips, appetizers like cheese, buffalo wings, goes excellent over chicken breasts and fish strips and all sorts of recipes that include eggs, soups and tortilla based dishes like tacos, quesadillas, chilaquiles, burritos, enchiladas and tostadas. 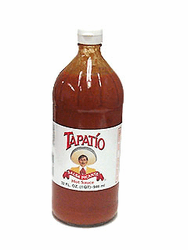 Tapatio is a thick sauce with low sodium, its gluten free, will add no calories or carbs to your dishes and has a gentle peppery flavor that offers a subtle peppery, salty warmth. You don't have to refrigerate after opening, just store in a dark, cool, dry place for maximum original flavor. Salsa Picante de chile rojo marca Tapatio, con chiles y especias. Tapatio es una salsa picante Mexicana conocida por su suave y salvaje sabor. Este sabroso condimento es suavemente picosa y es ideal para mejorar el sabor y darle a tus platillos un toque picosito sin irritar o entumecer la lengua. Es comunmente usada en botanas como fruitas, vegetales, papitas fritas, entradas como queso, sardinas, costillitas de Puerco, buffalo wings; se lleva excelente con las pechugas de pollo, los cocteles de camaron y las tiras de pescado; en bebidas como el clamato y en todo tipo de recetas que incluyen huevos, sopa y platillos a base de tortilla como quesadillas, tacos, chilaquiles, burritos, tostadas y enchiladas. Tapatio es una salsa picante espesa que tiene un suave savor a pimiento que ofrece un calor saladito y apimientado. No tienes que refrigerar la salsa despues de abrirla, solo guarda en un lugar fresco, seco y oscuro para maximo sabor. Agua, Chiles Rojos, Sal, Especias, Ajo, Acido Acetico, Goma de Xantano y Benzoato de Sodio como conservante. I put this sauce on almost everything from bbq burgers, fried chicken, tacos.... My favourite thing to put it on is duros :) has a nice smoky medium spice to it, not too hot. ProsReally great flavour without being too hot. Good texture, not gritty like some sauces. This sauce has an excellent flavor- more than just hot sauce. It is great on everything from Tacos to Hamburgers, eggs and BBQ. The history of the company is also interesting (started very small and grew to huge facilities- same owners). It reminds me of Tabasco but less hot and much less expensive!! ProsCheap, easy to find, consistent, very flavorful. It is also nutritious in Vitamin C and A.
ConsI always wish it was just a little bit hotter!! Excellent salsa picante hot sauce! I love hot sauces and this is one of my new favorites ,great flavor nice heat level.Its my new Ketchup!! Great flavor, great consistency. My favorite hot sauce for tacos. Not too hot, but tany and gives a south of the border taste to whatever it's added to.